The Korean economy is being decoupled from a robust recovery of the global economy this year, held back by sluggish domestic demand and deteriorating external conditions. Last month, the Ministry of Economy and Finance and the Bank of Korea revised down their 2018 growth forecasts for Asia’s fourth-largest economy to 2.9 percent from an earlier prediction of 3 percent. The Korean economy expanded 3.1 percent last year. Private economists, however, remain skeptical about the possibility of the lowered growth target being achieved with all economic indicators except for exports having taken a downward turn. According to the International Monetary Fund, the world economy is forecast to grow 3.9 percent in 2018 and 2019, up from 3.7 percent in 2017. It has kept the growth outlook for Korea at 3 percent for this year and 2.9 percent for next year. Economists here are concerned that Korea is losing its growth momentum at a time when all other major advanced economies, particularly the US, are on the path to robust growth. The US economy expanded at an annual rate of 4.1 percent in the April-June quarter, while Korea’s annualized growth rate for the same period remained at 2.8 percent, according to official data from the two countries. The US jobless rate was pushed up from an 18-year low of 3.8 percent in May to 4 percent in June partly because some job seekers opted to take time to seek better work amid a booming economy. The rate is expected to eventually fall to around 3.5 percent as employers are ready to snap up those entering the labor force. 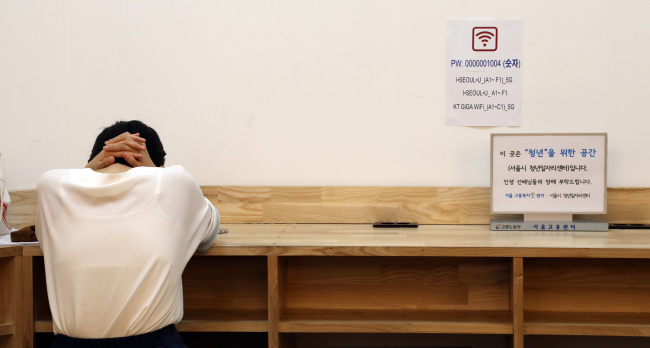 Korea’s unemployment rate, which averaged 3.1 percent in 2013, stood at 3.7 percent in June. Experts estimate its real jobless rate may be well above 10 percent. For the first time in decades, the Korean economy is set to be outperformed by the world’s biggest economy in terms of growth and unemployment records. “The local economy is seen as having entered recession in the second half of last year,” said Shin Min-young, an economist at the LG Economic Research Institute. In recent months, exports have bolstered the Korean economy, which has been troubled with sluggish investment and consumption. Korea’s outbound shipments made a 1.3 percentage point contribution to the on-quarter growth of 0.7 percent in the April-June quarter, with the contribution by domestic demand being a negative 0.6 percentage point. What is concerning is that prospects for the country’s exports are being clouded by the weakening of its key manufacturing industries, except for semiconductors, and worsening conditions abroad, including an escalating trade war between the US and China. Its exports increased 0.8 percent from three months earlier in the second quarter, slowing down from 4.4 percent in the January-March quarter. In the first seven months of this year, the country saw its outbound shipments rise 6.4 percent from a year earlier to $349.1 billion, according to figures from the Ministry of Trade, Industry and Energy. Apart from semiconductors, the increase rate fell to a mere 0.2 percent. Semiconductors’ proportion of Korea’s exports increased from 15.4 percent in the first half of last year to 18.7 percent in the following six months and 20.5 percent in the January-July period of this year. Global demand for semiconductors is forecast to decrease in the coming years, with Chinese firms set to begin mass production of memory chips in the run-up to the end of this year. This could precipitate a fall in the semiconductor export prices index. A recent study by the Bank of Korea showed the country’s exports have become less linked to changes in demand from advanced economies since the 2008 global financial crisis amid a structural shift in global trade. A 1 percentage point increase in aggregate demand in G-7 countries -- the US, Canada, the UK, Germany, France, Italy and Japan -- pushed up Korea’s outbound shipments to them by 2.2 percentage points in 2000-2008. In the years after the financial crisis, however, the elasticity weakened sharply as the country’s exports rose by 0.9 percentage points when demand in the seven major advanced economies expanded by 1 percentage point. Worsening external conditions are set to have a more negative impact on the Korean economy, which relies heavily on trade for growth. As of 2016, trade accounted for 63.9 percent of the country’s gross domestic product, compared to 42.6 percent for France, 38 percent for the UK, 33.3 percent for China and 25.4 percent for Japan, according to MOTIE data. Economists note the Korean economy is facing a complicated set of problems as exports are expected to slow down, with domestic demand showing no signs of rebound despite massive fiscal spending over the past year. “There is the possibility of the economic downturn going on far beyond the first half of next year,” said Ju Won, a senior researcher at the Hyundai Research Institute. Calls are rising for President Moon Jae-in’s administration to abandon its income-led growth policy driven by pro-labor measures and let private companies take the lead in increasing investment and employment. Economists note the Moon government should no longer be out of tune with global efforts to forge more business-friendly conditions by carrying out regulatory and labor reforms and cutting corporate taxes.